These aluminium drip trays are great for catching drips, but also perfect for baking lasagne, vegetables or even chocolate brownies! You can also use them as water pans for smoking and long cooks. 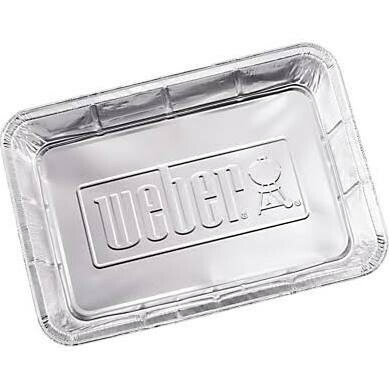 Weber drip trays protect your Weber barbecue from fat and juices that otherwise become baked on, making them difficult to remove again. They also collect juices to make perfect gravy. Weber drip trays have high sides to prevent spills when removing them from the barbecue. They also have a sturdy design making them reusable. Pack of 10 Suitable for all Weber Gas BBQs except the Weber Summit Range. Fits Weber Genesis and catches grease.